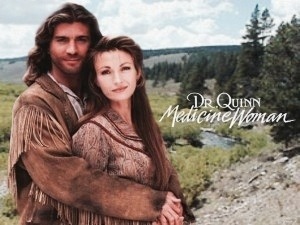 I remember watching the very first episode of Doctor Quinn Medicine Woman when it came on the air in 1993. I was 12 years old. I loved pioneer stories. And this one had everything, adventure, some action and even romance. It amazed me that this woman traveled half way across the country to a little town, determined to practice medicine. Even though no one really wanted her there. She never gave up, earning the respect of the townsfolk… most of the time. Plus, she had a super hot boyfriend who liked to take his shirt off. A lot. When I found that Amazon Prime had the first season available on instant streaming, I was a little reluctant to watch it again. It’s been what, 15 years? I mean, what if I re-watch the show now and it ends up being nothing like I remember… what if it’s total crap? My happy childhood memories would be crushed! After much fretting, I sucked it up and watched the pilot episode. I worried for nothing. And seeing Jane Symore then and now….. Dang. She really hasn’t changed much. She’s still hot, and she’s in her 60s! What magical rainbow-unicorn-fountain-of-youth did she find and where can I get me some?